The great black hawk, native to Central and South America, first appeared in August in Biddeford and now appears to be settling in for the Maine winter. 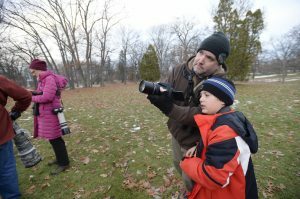 A great black hawk that’s native to Central and South America appears to be settling in for a Maine winter, giving birders another glimpse Thursday in Portland’s Deering Oaks park. Rob O’Connell and his son Declan, 10, of Cumberland watch the great black hawk that was drawing attention Thursday at Deering Oaks in Portland. The bird was first seen in Maine in August, when it lured excited bird watchers to Biddeford from as far away as New York because it was so unusual to see one in this part of the world. The same bird observed Aug. 6 in Biddeford was seen prowling the Eastern Promenade in Portland in late October, according to Maine Audubon. On Thursday, it was entertaining onlookers at Deering Oaks. The great black hawk is the most unusual bird sighting in Maine this year – if not for decades. It is only the second time the hawk has been seen in the United States, Maine Audubon naturalist Doug Hitchcox told the Portland Press Herald in August. 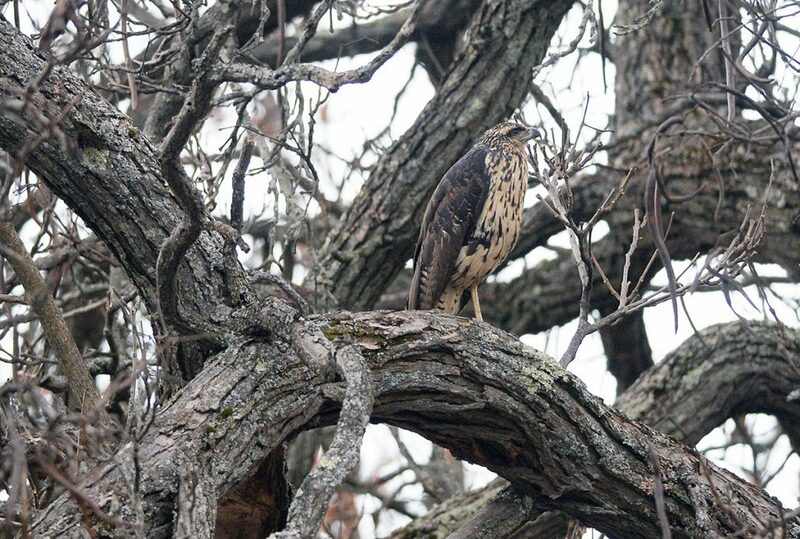 Birders flock to Biddeford to view hawk that’s been seen only once before in the U.S.
Every year, birders in Maine identify three to four species that had not previously been seen in the state. But only twice in the past four decades has a bird been found in Maine that is rarely or never seen in the U.S., Hitchcox said. The great black hawk is typically found from Mexico down through South America. Mostly black with a yellow bill that has a black tip, the average adult stands 2 feet tall and has a wingspan of 40 to 50 inches. There are white bars on the underside of the wings. The coastal bird of prey is often found near woodlands, where it feeds on reptiles, rodents, bats, birds, fish and amphibians. One of the raptors was seen this year in South Padre Island, Texas. How this bird ended up in Maine – and why it is still hanging around – are mysteries. But every year the state gets visits from birds – called vagrants by ornithologists – that fly far outside their normal geographic range, Hitchcox said.